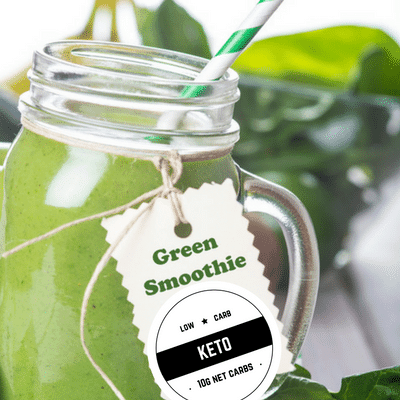 This is Part 2 in the series The Definitive Guide To Keto Mistakes. To start at Part 1 click here. 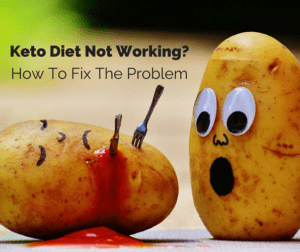 Is the Keto Diet not working for you? Maybe you aren’t losing weight or are feeling weak and tired. Perhaps you’re struggling to reduce your carbohydrate intake as much as you need to. Or maybe you just miss your carbs and feel like snacking all the time. It takes a while to transition to a ketogenic diet. The quicker you try to do it, the more likely you are to have issues. This is because there are a number of trip points that can make or break your results. The quicker you get down to a carbohydrate intake of 20-50g, the more of a shock it will be to your body. It is also difficult to take on some of the subtle principles of the diet which can have a huge impact on how you feel. 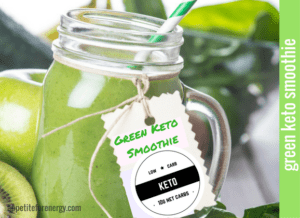 It also affects whether you stick with the keto lifestyle and get to enjoy its many benefits. Most of the fixes are simple to implement and can have an instant effect on your mood and energy levels. This post explores another 3 common trip-points that come up for ketogenic dieters. 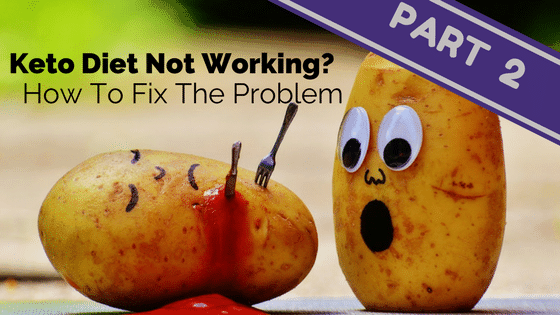 It is part 2 of a series of posts this month, which will cover how to fix some of the common issues people face. If you haven’t seen Part 1 click here. If you have gone through the guides in this series and it’s still not working for you, then it may not be right for you. It won’t suit everyone as we all have different physical and metabolic make-ups. Learn the 9 simple solutions you can apply today, to kick start weight loss. 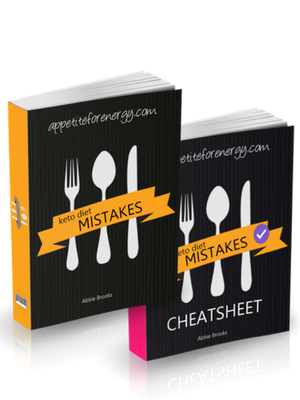 Download the FREE 30 page eBook on Keto Diet Mistakes AND the Cheatsheet to systematically skyrocket your results and melt off those extra pounds. Success! 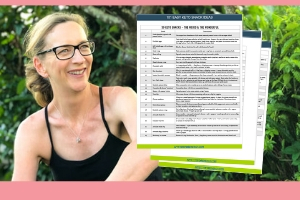 Now check your email to download the FREE 30 page Keto Diet Mistakes eBook AND the Cheatsheet. The cheatsheet is included in the book on pages 2 & 3. Yes, I'd like to subscribe and receive step-by-step low-carb guides and easy, 30 minute recipes that your whole family will love. An important distinction to make with the Ketogenic Diet is that it’s a high-fat, low-carb and moderate protein diet. There is a common misconception that low-carb, high-fat diets (LCHF) mean eating astonishing amounts of protein. This idea comes from the original Atkins Diet1 which allowed unlimited protein in the initial stages. (Current Atkins diets include a more modified protein approach). The Ketogenic Diet, however, aims for 20% protein or less (by calorie) which is in the range of 90-150g per day. The suggested amount of protein by keto researcher and expert Dom D’Agostino (Associate Professor in the Department of Molecular Pharmacology and Physiology at the University of South Florida) is 1-1.5 g of protein per kg of body weight per day to stay in ketosis. If you are highly active (particularly if you do resistance training) then your protein intake should be at the high-end of the range. Why Does Eating Too Much Protein Lead To The Keto Diet Not Working? When you eat too much protein, it gets converted by the body into glucose. This process has a fancy name called gluconeogenesis. So just while you are trying to keep carbs/sugars to a minimum, eating excess protein creates more! The liver transforms excess protein into glucose. This can cause you to feel hungry and will also prevent you from getting into ketosis and burning fat. 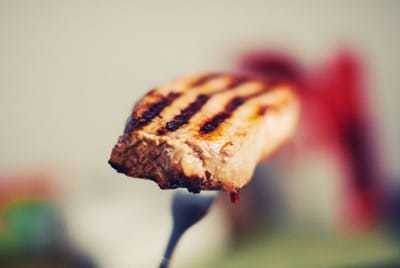 One option is to eat higher fat cuts of meat and less lean meat like chicken breast and turkey. If you keep your portion size small, this will increase your fat intake while keeping protein low. Alternatively, eat less protein overall and ensure you are getting plenty of fat from non-meat sources like avocado, olives, butter, dairy and oils. See our 11 Healthy High Fat Foods For The Ketogenic Diet in Part 1 of this series for more non-meat ideas. What Does 90g of Protein Look Like? Atkins, Robert C. Dr. Atkins’ New Diet Revolution. New York: Harper, 1999. Print. You will miss your carbs initially when you start a ketogenic or low-carb diet. They are often the easiest and most convenient form of food to grab when we are hungry or in a hurry. Carbs like potatoes, pasta and rice are also a typical accompaniment to many main meals. So there is a lot to get your head around when changing your diet. Do you try to replace the carbs with something similar? Or is it better to change your eating style so you avoid meals that need rice and carb type foods. We all know that a good curry is best when enjoyed with rice or flatbreads to soak up the sauce. I avoided carb substitutes for quite a while because they seemed like a lot of extra work. 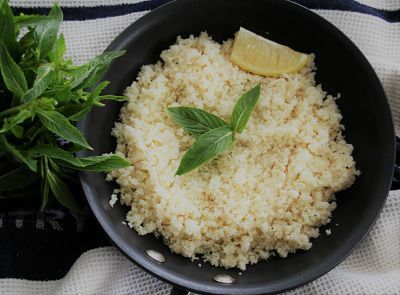 Eventually, I tried cauliflower mash and cauliflower rice. They both stand alone as great side dishes whether you eat low-carb or not. They are now a firm part of our regular meal plan. Zoodles (zucchini noodles) are another great carb substitute. There are a lot of fantastic alternatives to bread, rice and pasta. Try cooking cauliflower rice for example. You will discover that it is quicker to prepare than regular rice, far more healthy and tastes great. There are also now many pre-packaged cauliflower rice products that you can buy. You can buy frozen cauliflower rice (and broccoli), fresh cauliflower rice and also packaged cauliflower rice. It is getting easier and easier to stay on track with low-carb. Be sure to share any great new carb substitute products that you have discovered in the comments below, so we can all benefit! Many dishes work better with rice or pasta, so it’s worth embracing ketogenic carb swaps. Instead of pasta, use zucchini noodles (zoodles) or konjac pasta. Cauliflower mash is a delicious substitute for potato mash. Once you have a few of these in your repertoire, you will be able to cook some favorite meals that you had resigned to the keto scrap heap. For more carb substitute ideas, read our post on 9 Simple Ketogenic Carb Swaps. Solution : Get your carb fix by trying some of the many keto carb swaps such as cauliflower rice, cauliflower mash, zoodles (zucchini noodles), konjac pasta, keto bread and cauliflower pizza. See our post on 9 Simple Ketogenic Carb Swaps to learn more. The most surprising thing I found about eating low-carb is that as you become fat-adapted (burning fat not glucose), your hunger will drop away dramatically. This is when you realize that you are eating snacks out of habit and not out of hunger. I used to snack while preparing dinner and making kids school lunches for the next day. Eventually I discovered that I was not in fact hungry and that my snacking was just a habit. It can take some time for your body to become fat-adapted which means that you are burning fat instead of glucose. When this happens, you’ll find that you aren’t very hungry and can go for long periods without eating. This process can take days to several weeks from when you start a keto diet. While you are going through this process, you will feel some hunger. Don’t go hungry though – be sure to make a list of your go-to keto snacks (see below). When you start burning fat you will find that you don’t snack very often as you aren’t hungry!! 1 minute muffins – from Maria Emmerich’s “The 30 Day Ketogenic Cleanse” book. These are great and actually do cook in one minute – try with the suggested variations for a flavor boost (butter, 1 tsp erythritol, cinnamon). Solution : Make a list of your go-to keto snacks to turn to when you are starting out. As you become fat-adapted and are burning fat for fuel instead of glucose, you won’t need to snack. Are You Making These Keto Diet Mistakes?